In Celebration of Women’s History Month, all the posts in March will have to do with famous historical women. A name given to many a noblewoman back in the day, this French name has seemingly gone out of style. Hortense (pronounced: or-TAWNS) is the French form of the Ancient Roman name Hortensia, and is derived from the Latin word ‘hortus’, with the overall meaning being ‘of the garden’. This name seems to be a huge turnoff for people outside of France and I assume that is from a mispronunciation of the name, as this happened to me as the King Charles II song on Horrible Histories made me believe, (and excuse me for lack of a better translation) – ‘WHORE-tense’ and really that pronunciation is not very good. As the French language does not pronounce ‘H’ you can see why with their pronunciation and added with the meaning, it could be a much prettier name that people give credit for. Throughout history though there have been women who were bestowed the name Hortense. While there was an anthropologist and a reggae singer named Hortense, two of the most famous Hortenses where noblewomen. The first one was Hortense Mancini, an Italian Noblewoman in the 1600’s who was favourite niece of Cardinal Mazarin and one of the famous Mancini sisters. Despite a failed marriage, Hortense went on to become the maitresse en titre of King Charles II before having an affair with Charles’ illegitimate daughter Anne and then the Prince of Monaco. 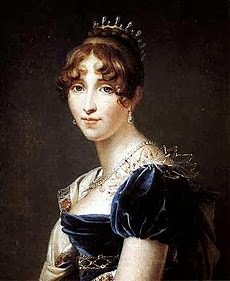 The second Hortense was Hortense de Beauharnais, pictured, who was the daughter of Josephine Bonaparte and the stepdaughter of Napoleon. A skilled musical composer and a celebrated member of Parisian society, Hortense married Napoleon’s brother Louis and became Queen of Holland. Mother to both Louis II of Holland and Napoleon III of France, Hortense even carried out an affair and bore an illegitimate child. Despite two significant and celebrated beauties bearing the name, it has never been an overtly popular name though its popularity is more significant in France where in 2011 it was ranked #311 and used 204 times, the most times it has been used in France between 2000-2011 though not its highest ranking. In America however, the name has not ranked since 1941 where it was just inside the Top 1000 at place #948 and today, less than 5 babies were given the name if any at all. The highest it ever ranked was back in 1883 at spot #386. It has got to be the pronunciation that stops people using this name, or is it because the first three letters match the first three letters in Horse. I say the former but people can be turned off a name by the strangest ways. With two productions seemingly to be in the works on the life of Napoleon, maybe people will be enlightened with the pronunciation of this name. In the meantime, I am now a strong defender of the name Hortense. It may not be my all-time favourite name, but I would celebrate someone using this name.